It's time to stop just going through the motions. 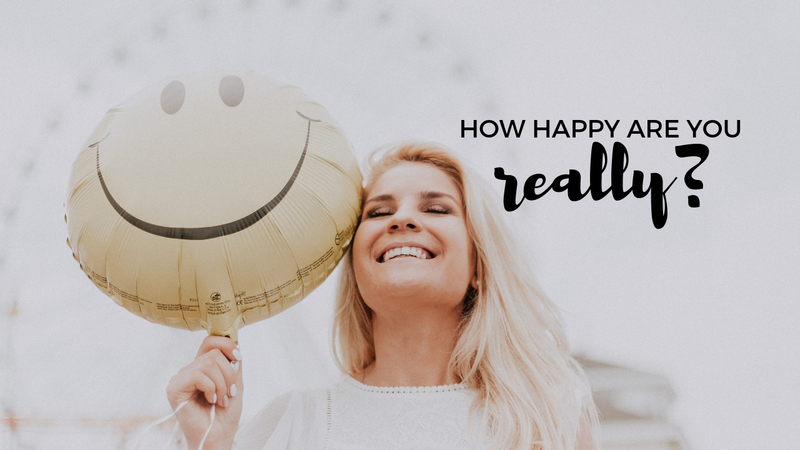 Today I want to challenge you to take a real look at how happy you actually are - right now! Today I want to challenge you to take a real look at how happy you really are right now. It’s easy to end up living our days like we’re just going through the motions, right? But most people don’t make it a habit of taking a step back and evaluating how happy they actually are. Unfortunately, most people aren’t very happy, especially in their 30s and 40s. Studies have actually shown that there’s a happiness curve in life and that it’s shaped like a U, meaning happiness is high when we’re in childhood, then starts going down in our 20s, is at the bottom in our 30s and 40s, and starts climbing again in our 50s. But that happiness curve makes sense when you think about it right? Those typically unhappy years are the ones where most people have way too much on their plates. We’re balancing kids and marriage and family and building careers – and everything else that goes with all of it. Most people don’t spend enough time properly taking care of themselves, and stress and burnout are way too common in that bottom part of the happiness curve. And the hard part is that all of the things that we’re trying to balance in our lives are supposed to be the things that bring us happiness! So we end up feeling guilty that we’re not happy – which just leads to more stress – and so it becomes a vicious circle. Most people don’t make changes until they’ve hit their version of rock bottom – which can look like burnout, divorce, careers ending, a so-called midlife crisis, or major stress-related illnesses – but that doesn’t mean it has to be that way for us. The more aware we are, the more we can consciously decide to be happy and follow a different happiness curve. The first step to being aware is stopping to notice how happy you are. I worked with an awesome coach recently and a big part of what she had me do was just to get curious and notice things about myself and my life that I didn’t typically pay any attention to before. It sounds so simple but nothing improves if we’re not even aware of the issue, does it? So – back to my challenge to you today. Take a real look at how happy you are. That’s the one thing I want you to get out of this. Stop and notice…do a little self-assessment. A great way to do this is to score yourself in different areas of your life. I have my students do this, and I want to share it with you today because it’s an awesome first step to boosting your happiness. So let’s do this little exercise. How happy are you with your family and your friends? How happy are you in your romantic relationship? How happy are you with how much fun and recreation and hobbies you have in your life? How happy are you with your health? How happy are you with your finances? How happy are you with your personal growth, and the time you invest into learning and bettering yourself? How happy are you with your physical environment? Where you live, where you work? And finally, how happy are you in your career or your business? Just the simple act of taking that step back like this and assessing how happy or satisfied you are in different parts of your life can lead you to making changes for the better. And most people don’t do this very often. They don’t often stop the busy, crazy roller coaster and look at all the parts of their lives and just notice the things that are causing them to feel dissatisfied. Noticing is that critical first step. So that’s your homework for today – just notice. I promise you’ll get so much out of it. I really hope this helps you, and if you’re a Mom and you liked this, then you’ll love my new FREE video: My 5 Best Ways To Beat Mom Burnout. It will give you simple, practical, and actionable things you can do to bring more balance and happiness into your life right away. Click here to check it out!